Read what our patients have to say about their experience with us. The staff was very patient with me and answered all of my questions. I was glad to have someone come to my home because it was hard for me to walk because of my arthritis. The staff are very friendly and approachable. I can easily talk to them about my concerns regarding the type of care I need. I am very satisfied with the way they are handling and providing services. New Life Home Health Care LLC and their staff are very welcoming. They are always there when I need them. At first, I was having second thoughts about getting a stranger to take care of me, but that changed because their staff and I got along well immediately. 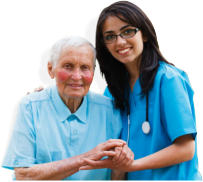 All I can say is that New Life Home Health Care LLC is perfect for anyone who needs taking care at home. They are really good at providing medical services.